Valde is an attractive combination of glass, aluminum, glossy laminates and contemporary wood finishes. The range allows extension of the units and alleviates many visitors needs by adapting to requirements and regulations. The Valde collection of reception desks is a contemporary modular system that permits a number of configurations and can be designed with your space in mind as all units are different. 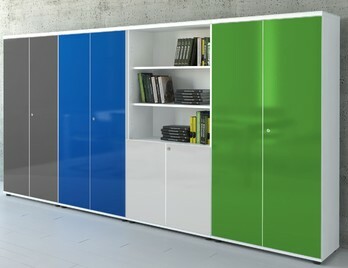 The horizontal strips contrast against HPL laminated fronts in a choice of modern high gloss colours. A visually attractive combination of glass, aluminium, and glossy laminate. The coloured or wood styled fronts and silver footplates are lit up with LED lights creating a lasting impression on visitors. This reception desk has all the right elements from a sweeping 90-degree curve to a practical straight desk and inconspicuous storage boxes at each end with three compartments. We can also supply matching storage in any of the contemporary colours and wooden finishes associated with the Valde range. Straight reception desk from the Valde series with stunning high gloss fronts in a selection of five colours. Includes a desk height area for easier access. 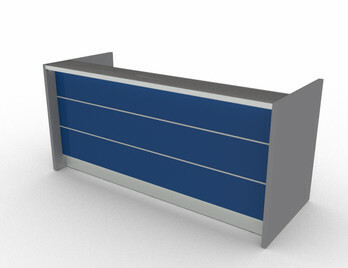 Modular reception desk with many other variations. Download our catalogue for further information. 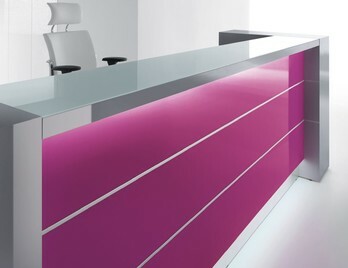 Stunning wave reception desks with high gloss fronts in a choice of five modern colours. Optional LED lighting feature beneath the counter and above the plinth. Modular reception desk with many alternative variations to suit your space. Free design and space planning service. 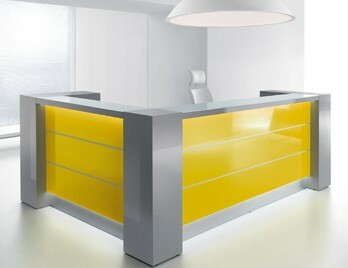 Stunning straight reception desks from the Valde range with illuminated high gloss fronts in a choice of five colours. Includes lighting below the counter and above the kick plate. 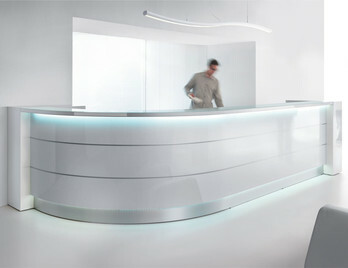 L shaped reception desk in a choice of three sizes with LED lighting under the glass counter and above the kick plate. This L shaped desk is priced with side panels and does not include the storage end cupboards as shown in the photographs. Available in a choice of three sizes. Available in 20 day with free delivery and installation. 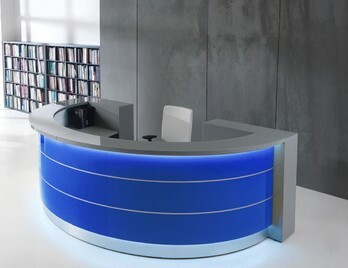 Semi circled shape reception desk in a choice of three sizes with LED lighting under the glass counter and above the kick plate. This half moon desk encompasses the user and will wow each visitor as the LED lights set off an intriguing ambience. The desks supporting body are made up of useful storage ends which feature two shelves making three large compartments in each. 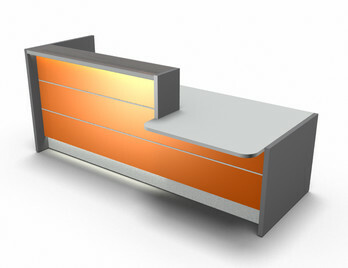 The front of the desk is again available in standard Valde gloss and wood finishes. Compliment the Valde reception desk with this stunning storage hi gloss storage range in matching or contrasting vibrant colours. 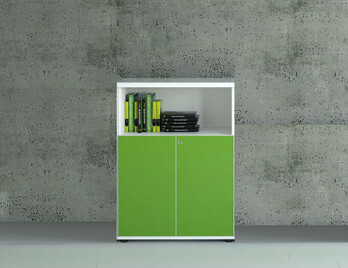 Each storage unit has HPL fronts and is a useful addition to any reception or office area. Compliment the Valde reception desk with this stunning storage high gloss storage range in matching or contrasting vibrant colours. 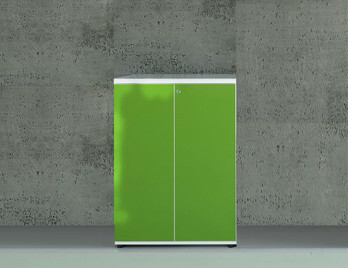 Each storage unit has HPL fronts and is a useful addition to any reception or office area. Combined with the horizontal decorative strips the effect is stunning and will give a unique look to any modern reception area. The working desk top is finished in white as standard and the support columns are available in white or in a contrasting chestnut finish. These support columns can have shelves inside and a door if required for convenient storage. We have supplied the Valde reception desk in many different environments as it is both functional from the users side and equally stunning from the visitors side this is partly due to the LED lighting which is secured and protected from behind the front of the high gloss facade and from underneath the counter top. The counter top is made of white tempered glass which is a perfect match for the high gloss frontage panels. From our experience the Valde is one of the most successful reception desks that we supply as it has been priced competitively and has a wealth of features which sets this desk apart from its contemporaries. It is a modular reception desk system which means there are many interesting curves, shapes, linear straight sections and low counter sections which can be designed as specified to your liking. We can also specify the modular units at hardy no extra cost please call for details if you require something more specific. You can view and select the most popular configurations and layouts on Office Reality and our sister web site Online Reality. We can supply high gloss laminate samples along with a professional design service and computer generated drawings showing the Valde reception desk in situ within your specified environment free with no obligation. The lead time for this desk is around 4 - 5 weeks as it is made to order.